I pieced together some of the videos I took from the 17th row at the March 7 concert at The Good Life Festival at Encanterra in San Tan Valley, AZ. Sorry for the shaky filming, I was dancing. When RS is on the road, it’s almost easy to forget that he has a personal life. There is photo after photo of him with fans and video clips of his shows posted on Facebook and Twitter feeds and some fans post updated information about him as the days go by, depending on what he chooses to reveal about himself during his shows. But that’s been it for the week. 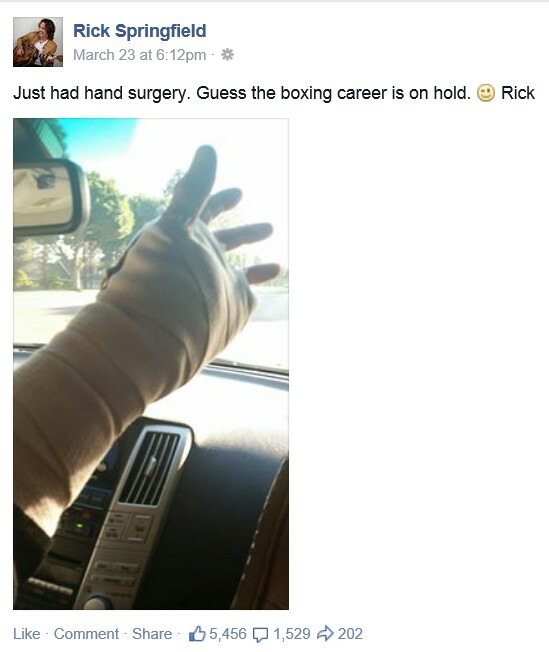 There are now more than 1,500 comments on the post, mainly with get-well wishes, offers to take care of him, Dr. Noah Drake jokes and hoping he’s better in time for the show they were planning to go to. Does he read the comments? Would he want to? Meanwhile, now he’s at home with his family, taking a break from the meet-and-greets and their smiling snapshots, one after another; human touches; expectations to always be “on”; and other rock star roles. And apparently healing from surgery. At one of the Q&A sessions at a Stripped Down concert I saw online, he mentioned that his sons thinks it’s weird that so many women are obsessed with their dad – after all, he’s just their dad to them, not a rock star. I just think that is hilarious – and beautiful. Is being a “rock star” just a job? (Or a rock star/writer/actor if you want to get specific.) A cool, fun one, to be sure, but is it just a job he can leave outside the door when he gets home? After 50 years of playing guitar, Rick Springfield has finally made it! What marks this milestone? His very own tribute band! A group of guys in St. Louis recently formed Working Class Dogs to pay homage to Rick Springfield. 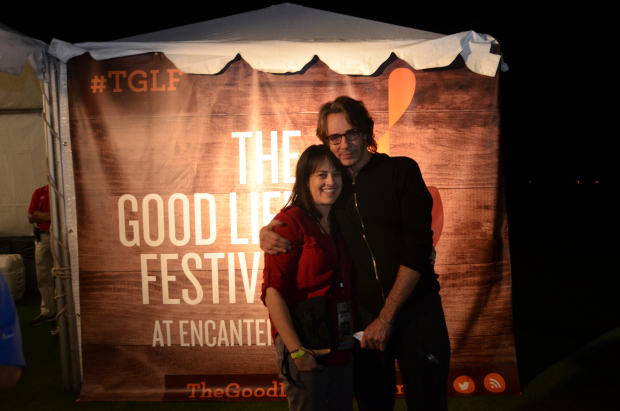 One thing that inspires me the most about Rick Springfield is his drive to doing what he loves. He’s already an accomplished musician, songwriter, author and actor. Who knows what he’ll do next? He likely has more music, songs, books and acting gigs in his path and maybe he’ll even discover another passion, like some kind of charity work or ambassadorship. You never know, but he is so talented and driven that he has many options. When he was younger and going through difficult times, he may have never imagined the type of success that would someday become his but he kept persevering and that is so beautiful and inspiring. Maybe this means I’m on the verge of a midlife crisis but I’ve been feeling very introspective lately, reflecting on where I am and how I got here. And trying to figure out what’s next. On one hand, I have everything I ever wanted – a wonderful husband, amazing kids, good health and a job I enjoy. On the other hand, one thing that I never emphasized that much is the financial compensation that helps make life a little easier. In my equation of what makes a successful life, I idealistically thought that money wasn’t an important component of it. But now with three kids I’m kind of wishing that my passion would have focused in a different direction than print journalism. True, there wasn’t any clue that the Internet was coming and how that would impact my desired field but why didn’t I pay attention a little earlier? A few weeks ago, I passed my exit on the freeway because I was deep in thought about something. The following day, I almost did it again. Then when I started thinking about why that was happening, it occurred to me that passing an exit is really a metaphor of life. If you are “driving” through life without paying attention to where you are going, you could end up lost. And I’m wondering if we’ll get back home again. As I approached the tents set up behind the stage, I saw him standing behind a group of people who had been further ahead of me in line. “There he is,” I screamed in my head, although I tried to walk as nonchalantly as possible since I wasn’t actually authorized to be there. I’m not quite sure what I expected when it was my turn – some kind of recognition in his eyes maybe? Even though there was no reason why he should recognize me. I was surprised by the paleness of his eyes and he looked a little tired. He didn’t really look at me at all, but past me, most likely to see how much longer the line was. His strenuous schedule must be exhausting and he was probably ready to call it a night and get some rest before heading to Texas the next day (or even later that same night). I hadn’t prepared what I was going to say to him – really the only plan I had was to give him the printed note in my hand with this blog address on it. I had printed it out right before I headed out the door, “just in case.” I even held it in my hand when he was in the audience for “Human Touch,” just in case that was to be my only chance to give it to him, but he didn’t make it to my row. In retrospect, that was a good thing because the paper would have likely ended up trampled on the grass. Anyway, as we turned to the camera for our photo, I handed him the folded piece of paper and said, “This is for you.” He looked at it, took it and said “thank you.” I don’t even recall having the photo taken because I was trying to think what else I could say. I almost blurted out “I’ve been a fan for 30 years” after the photo but it seemed like I already lost my moment because Matty was already shooing over the next person and that person had a guitar for RS to sign. The next day when I found our photo on the radio station website, I was relieved that it turned out so well. It allowed me to read all kinds of positive signs into his body language – leaning inward and not outward, hand on arm and not draped over shoulder, his cheek on my head, a smile (did I compare it to his body language in the other photos on the radio station’s website? Maybe.) And my eyes weren’t closed, so that was a bonus. He didn’t look at all tired in the picture, only really cute. Although RS says he enjoys meeting his fans, I bet the meet and greets can get tiring, especially if there are people who are not necessarily serious fans but those who just think it would be cool to meet “that Jessie’s Girl guy” or “Dr. Noah Drake.” But I for one am very appreciative that he does them (and I’m sure many other fans would agree…). I can’t believe it’s been a week since I wrote my “This time tomorrow” post. The week sped by. The day after the concert I spent the morning volunteering at a carnival at my youngest son’s school then was outside all afternoon at a park for a birthday party for another son’s classmate. By the time I got home I was exhausted and had to rest for awhile (a nap in the middle of the day is a rare but welcome indulgence for me). When I woke up, I had a 102-degree temperature and ended up home sick for three days. My husband prepared meals, did the drop-offs and pick-ups and put the kids to bed. I made some appearances but wasn’t much help through Tuesday night. Since Monday and Tuesday are our busy days at work, I did spend some time on the computer finishing whatever writing and editing needed to be done for this week’s issue. I figured that if RS could keep his commitment to his East Coast tour schedule, traveling in freezing temperatures with a raging cold and performing multiple stellar concerts (even if it meant swigging cough medicine between songs), making appearances at meet-and-greets (which included more performing) and conducting interviews, I could certainly manage to drag myself out of bed to sit at the computer, sipping tea in my pajamas, to help meet our paper’s deadline. So I did – in spurts, heading back under the covers when I got the chills. By Wednesday I was feeling much better but worked from home since I still had a fever and a sore throat. I returned back to the office and a normal routine yesterday. So Friday really came quickly this week. Believe it or not, I have plenty more to write about my 20-second meet-and-greet with RS, but for now I have lots of catching up to do around the house from this lost week so I’ll have to write about it later. For those who are about to see your RS show this weekend – enjoy! A brief crossing of paths! Not only did I have a great afternoon with some friends, but it all culminated in meeting Rick Springfield! We got to The Good Life Festival at Encanterra and decided to purchase the wine and beer tasting passport – which meant you walked around with a wine glass strung around your neck and got up to eight “tastings.” I was hesitant to get it at first because it was $25 and I’m kind of a lightweight nowadays so I didn’t think I’d drink that much. But in the end, it was totally worth it! So I went with my best friend from junior high/high school – this was our fourth RS concert together over a 30-year period – and we met up with another friend from high school and two of her friends and had a great time catching up and hanging out. I got my picture taken with a cardboard cutout of Rick Springfield at the 94.5 Kool FM booth and we all entered the radio station’s contest to win a meet and greet with him after the concert. We watched Howard Jones from our seats in Row 30, which was nice, then went back to the festival part to get another round of drinks and to visit the radio station booth for the meet-and-greet drawing. None of us won. The show went pretty quickly. Maybe because he was the headliner of an all-day festival it was shorter than usual or maybe because I wanted to hear more songs, I don’t know. But I wasn’t ready to go yet. I told my friend that we couldn’t go yet and because she’s a great friend and knows the depth and longevity of my RS infatuation, she went along with it – and encouraged it. Instead of going left and away from the stage, we went to the right and to the side of the stage and stood with people waiting to go backstage. Before I continue, let me just say that by nature, I am a compulsive rule-follower. I usually try to do the right thing and play by the rules. But then sometimes there are those once-in-a-lifetime opportunities that come up that I don’t want to later regret missing. Plus (at the risk of offending those that pay big money for a meet-and-greet), I wasn’t hurting anyone by joining the line and wasn’t causing anyone else to miss out. Anyway, remember that wine-tasting passport I mentioned? Well, the lanyard was similar to the one on the backstage passes and it was dark. I mentioned in previous posts that March 7 would have been my mom’s 70th birthday. When we used to go to plays or concerts, my mom liked to stay afterward and meet the performers to get their autograph. She was one to try to make the most of opportunities and I knew she’d be rooting for me – perhaps she was even the one to arrange it from up above. So I joined the line and walked backstage and there he was! We were told that we couldn’t take a photo with him using our own camera but one would be taken by a photographer and posted on the radio station website. The first thing I noticed was his incredible eyes. He looked a little tired and there was so much I wanted to say but I just handed him a folded piece of paper with this blog address on it and said, “This is for you.” He said, “thank you” and took the piece of paper. Then the photographer took our picture and it was time to move on. I’m going with my best friend from high school – someone who remembers well the years my walls were plastered with RS posters and who I have gone to past concerts with. I found out on the Good Life Festival Facebook page that one of our other friends from high school who I haven’t seen in a few years will also be there so we plan to meet up at the festival part beforehand. It also would have been my mother’s 70th birthday so she will be there in spirit, too – she definitely knew what a big fan I was! Anyway, now that I’ve written this blog for a few months, I feel like I’m pretty caught up on most things RS, at least the things he shares with the public. Of course I’m hoping to cross paths with him tomorrow somehow – and of course it would be fabulously awesome if I do – but at the very least it’ll be a great show (I hope he’s feeling better… at least it’s warmish and not icy) and it’ll be fun to spend the day with my friends. Of course there’s no way of knowing if RS has seen this blog (in all likelihood he has not, who I am kidding) but maybe he’ll come across this years from now and it’ll bring a smile to his face. RS, is your left ear ringing? There’s a superstition about your left ear ringing when somebody says something good about you and there’s also a superstition that your left ear burns when a woman is speaking of you. If both of those superstitions were true, RS would likely constantly have ringing, burning ears. I remember watching an interview with RS that was filmed right after he watched the documentary about his fans “Affair of the Heart” (Or maybe it was actually part of the film, I can’t remember, I better watch it again.) and he said that he had no idea that his fans felt that way about him. He thought they came to the show, had a great time then left and that was that. He must have known that it wasn’t the case in the 1980s when his image was the first thing thousands of teenage girls saw in the morning when they woke up and the last thing they saw at night because his face was plastered all over their bedroom walls.